This is reportedly the first large-scale zombie film I’ve seen out of Japan. There have been some low-budget exceptions, such as Emergency: Living Dead in Tokyo Bay or Junk, but in general, the market has proven relatively resistant to the seductive appear of the genre; even World War Z barely cracked the top 30 for the year in Japan. Much like The Walking Dead, this was first a very successful series of comics, selling over four million volumes, and it makes a very slick transition to the screen. Initially, it’s a little like Shaun of the Dead, with a hero blithely oblivious to the rising tide of flesh-gnawing madness, as he goes about his everyday life. In this case (the ultimate bit of self-referential metaness), he’s Hideo Suzuki (Oizumi), a manga artist in his mid-thirties stuck doing work-for-hire, and unable to get any of his own ideas off the ground. And as in Shaun, his girlfriend dumps him just as things are kicking off. However, he does have one thing which makes him uniquely equipped for the Japanese zombie apocalypse. He’s a hobby shooter, and so is one of the very, very few Japanese with a gun. 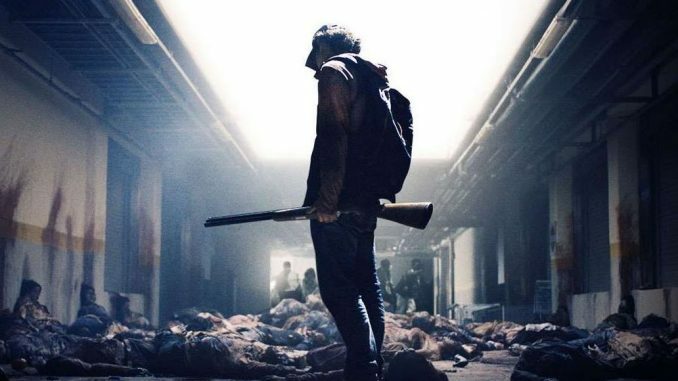 That’s really the aspect that separates this and is a refreshing change from, the typical American zombie film where everyone starts to pop off like Clint Eastwood at the first moan. Here, Hideo (whose name, spelled out in kanji, can also be read as “hero”) refuses to lend his gun to anyone, because that would be against the law, and one of the few possessions he carries with him is his official permit. 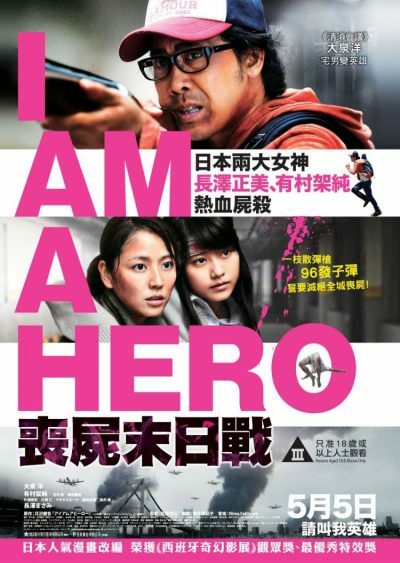 He escapes the chaos of Tokyo in a hijacked taxi, rescues schoolgirl Hiromi (Arimura), who gets bitten but not entirely turned, and finds refuge in that old staple, a shopping-mall, where a hardy band of survivors have taken refuge. There, his gun – coupled with Hideo’s refusal to use it – becomes pivotal to the story, as it’s coveted by the leader of the group, Iura (Yoshizawa). It makes for a winning combination of large- and small-scale mayhem. The scene where Hideo is trying to make his way through the streets of Tokyo is borderline epic, with an escalating sense of carnage that stands up as well as anything in World War Z. Yet, there’s a sharp creepiness to the zombies (or “ZQN” as they’re called), not least about the eyes. Fast-moving they may be, yet they’re still disturbing. In the middle, it looks like we’re going to head off down the road walked by Romero’s Day of the Dead, where the greatest threat to humanity’s survival is humanity itself. Then, we get a grandstand finale which puts Hideo in the middle of an underground parking-lot, facing an advancing mass of enemies from both sides. It turns out he was extremely wise to save his bullets, though a minor demerit is awarded for that climax, due to its excessive reliance on CGI splatter. If Sato had painted the walls physically red, we’d be up there in Dead Alive territory for gore. Instead, this is “only” a generally impressive and solid entry to the field. This may have been the first of its kind; hopefully, it won’t be the last.